UNESCO has declared 2019 as the International Year of the Periodic Table. This is the 150th anniversary of Dmitri Mendeleev’s publication of the “Periodic System” that organized the known elements into a periodic system that predicted the existence of ten unknown elements. The periodic table is not a theory, just a way to organize facts that any theory of elements must explain. Mendeleev’s publication kicked off a storm of discovery in the late 1800’s that continues to the present day – 4 new elements were named in 2016. Read more about the history and impact of the Periodic table. Or take a 6 question quiz to test your knowledge of the elements! The ACPBC Undergraduate Student Scholarship, in the amount of $1000, is awarded annually to an ACPBC student member enrolled in third or fourth year of an undergraduate Chemistry program at a British Columbia university. The award is equally based on academic performance in all completed Chemistry courses and service to the Chemistry profession. The application deadline is February 15, 2019. The award will be announced by the end of March. See the poster. Further details on the scholarship application and an application form are given here. The Ministry of Environment and Climate Change Strategy has posted additionals and revisions to the BC Field Sampling Manual concerning ambient air monitoring protocols. Do we have one? We can certainly identify chemistry and chemists within a very wide range of sectors going by other names: environmental, pharmaceutical, governmental/regulatory, oil and gas, pulp and paper, mining and smelting, advanced materials, etc. The contemporary buzz is that there is “strength in diversity” but there is also risk of isolation and assimilation. The goal of this session is to give a snap shot of chemistry across sectors in BC and to highlight the issues that chemists face in each sector. 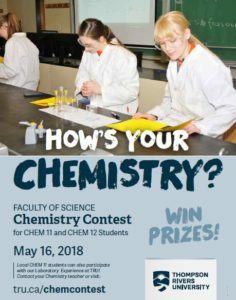 How can one prepare for a career in chemistry in BC? The diversity of roles for chemists and the rate of change pose challenges for universities, and for the Association as we strive to keep up with who is a chemist. What are the commonalities across the sectors? What career supports are needed at various stages? The overall goal of the afternoon is to understand common themes that will assist the ACPBC in strengthening the profession in BC. The AGM is open to all ACPBC members and will include: the business of electing the Directors and Officers; the audited financial statements for 2017 – 2018; ratification of the Audit committee for 2018 – 2019; announcement of membership for the Nominating, Membership and Registration, Professional Affairs, and Discipline committees; and the report of the Board of Directors. Unable to attend the AGM or the pre-AGM discussion in person? If you are unable to attend the AGM or the pre-AGM discussion in person you will be able to participate via a web conference. Contact the Registrar (registrar(at)pchembc.ca) by noon Oct 24th to allow time to make the arrangements. Alternatively, you can select a proxy to attend the meeting on your behalf. The proxy form is located on the website and should be returned to the registrar prior to the start of the meeting by e-mail or by the proxy at the meeting. The application deadline is October 26, 2018. The award will be announced by the end of November. The Science Advisory Board for Contaminated Sites in BC announces its Annual Conference and Workshop to be held in Vancouver September 26 and 27, 2018. The SABCS workshop on September 26 focusses on Innovation in Data Acquisition, Analytics and Automation for Contaminated Sites and Mining Environmental Applications (Draft Workshop Program). The 8th annual conference of the SABCS on September 27 2018 has a wide-ranging program covering current issues in contaminated sites in BC (Draft Conference Agenda). For registration go to registration here. For more details see www.sabcs.chem.uvic.ca. Early registration for the conference closes on August 24. AGM October 26, 2018 – Save the Date! October 26, 2018 from 5:00-7:00 p.m.
Room will open at 4:30 p.m. Call to order at 5:00 p.m. Check it out and win prizes! Details at chemcontest.